Heyman, Eva The Diary of Eva Heyman – Child of The Holocaust, Yad Vashem, Jerusalem 1988, pp. 70-73. Rosen, Hadassah, One in the City and Two in a Family, Hakibutz Hameuchad, Ghetto Fighters House. Flinker, Moshe, Young Moshe’s Diary – A Spiritual Torment of A Jewish Boy in Nazi Europe, Yad Vashem, Jerusalem, 1965 pp. 19-20. Liberman, Cila, Celinqa: A Child Survives Auschwitz, Yad Vashem, Jerusalem 2002, pp. 16, 18, 23-25. Heyman, Eva, The Diary of Eva Heyman – Child of The Holocaust, Yad Vashem, Jerusalem 1988, pp. 70-73. Ibid, pp. 89, 91, 92. Lau-Lavie, Naphtali, Nation as a Lion – an Autobiography, Ma’ariv Guild, [Hebrew] 1993, pp. 84-85. Kawinta, Chava, Excerpts from: I Am Still Living, Simon and Pierre Publishing Company. Rudashevski, Yitskhok, The Diary of the Vilna Ghetto, Ghetto Fighter’s House, Hakibutz Hameuchad Publishing House, 1973 p. 19. The testimony of Israel Ernest. Yad Vashem Archives O.3/10187. 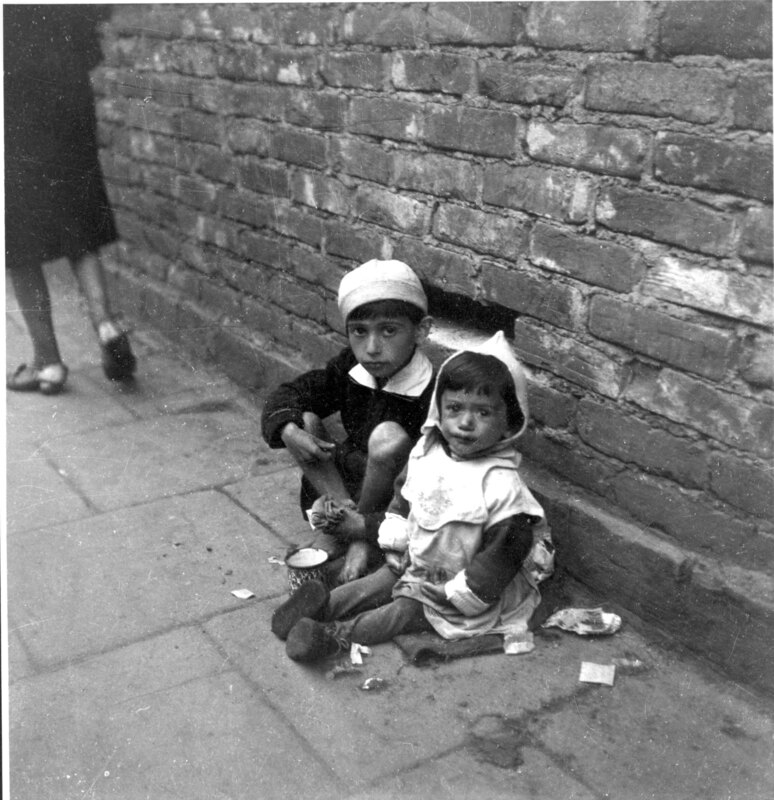 Aurbach, Rachel, The Streets of Warsaw 1939-1948, Am Oved Publishers Tel-Aviv 1954, p. 43. Yad Vashem Archives AR1 M.10/1065. Eilati, Shalom, Crossing the River, Yad Vashem, Jerusalem 1999, pp. 110-111. Amariglio, Erika, From Thessaloniki to Auschwitz and Back, English translation: Theresa Sundt. Vallentine Mitchell & Company, London and Portland, Oregon 2000 p. 54. S. Rapoport [Ed. ], Yesterdays and Then Tomorrows, Translated from the Hebrew version, Yad Vashem, Jerusalem 2000, p. 122. The testimony of Bilha Shefer. Yad Vashem’s Archive O.3/10682. Tatelbaum, Itzhak. Through Our Eyes – Children Witness the Holocaust, I.B.T. Publishing Inc., Jerusalem 1985, p. 108. 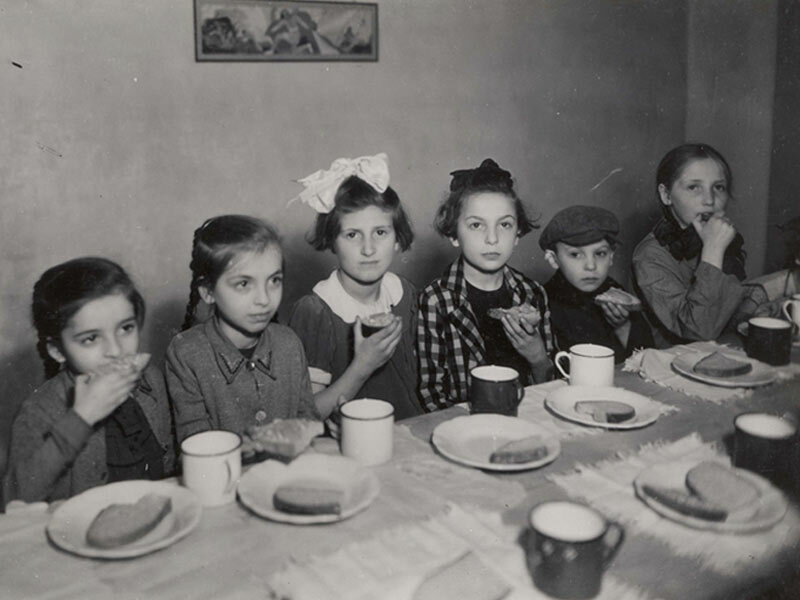 This lesson focuses on the Jewish child during the Holocaust. As a consequence of Nazi racial doctrine, the Nazis considered Jewish children and infants to be their enemies as well, and related to them as such even before murdering them. A million and a half Jewish children were murdered by the Nazis. How did Jewish children grow up under Nazi rule? How could a child grow up when people related to him as a dangerous enemy? Did these children have a “childhood”? We will examine these questions in light of the definitions of the terms “child” and “childhood” that are accepted by our society. Furthermore, we will examine what the adult world is expected to provide for children. A child is a dependent creature. A child is completely dependent on adults. A child is a smile. A child is a game. Add a sentence of your own: A child is ________________________. About adult-child relationships – natural and self-evident? What are the things that children need? Who should provide them with these things? Is it natural to provide children all of their needs? Are all children provided with their basic needs? “I think they heard the baby crying, and that brought them as far as our hiding place. Let the child go, he hasn’t done anything, he’s only a baby! From these words, how did the Nazis define Jewish children? A Jewish child is _________________. Read the following testimonies and choose two of them. Check the Declaration of Children’s Rights and find the clauses from the Declaration that were violated in the testimonies you chose. After reading the testimonies, share your thoughts and feelings with your class. Moshe Flinker was born in Holland. He fled to Belgium where he hid with his family. In Belgium, Moshe kept a diary. He was murdered in Auschwitz. Cila was born in Kielce, Poland. When she was seven, the Germans occupied Kielce. She was taken with her family to the Henrikov concentration camp on the grounds of the former ghetto. Some two years later, in July 1944, when she was 12, she was sent to Auschwitz-Birkenau with her family. From there she and her mother were deported to the Ravensbrück and Malkov concentration camp. Her brother Tadek died in a concentration camp a few days before the liberation. At the end of the war, Liberman and her mother were reunited with her father. In 1949, Liberman immigrated to Israel. She was 17. "We returned home joyfully, but it seemed as if everything had changed. A strange sadness gripped everything. The houses had become gray, and the treetops looked as if they had gathered their branches to hide the birds that were flying around peacefully and tranquilly. The town in which I was born, the house in which I grew up, had become alien to me. "Two families who had fled the German border reached our house. Those families arrived in a fancy car, and they had two children and lots of suitcases and packages. Mother told us that they were friends from long ago, and we had to make them welcome until they could continue their flight to Russia." "We gave them the children’s room. From that day on, I felt neglected. The room I loved; the toy corner where I spent most of my days – other children were playing there. I wandered from place to place, looking for a corner of my own, but no one paid any attention to me. I didn’t find a quiet corner." "A knock at the door. On the threshold stood a dusty man with a long beard, his eyes red from the dust and the wind, but radiating goodness and love. ‘Father!’ we shrieked together. He hugged us tightly and wept. That was the first time I saw Father cry. ‘Father! Why do you have a beard? Why are you so dusty? Why are your eyes red? Why? Why?’"
"‘The war has started,’ replied my father. The words sounded like a bell tolling bad news. He said it slowly, enunciating each syllable separately. He didn’t speak – he wept." "Every now and then we asked ourselves whether this was what the world was like. Will the strong always dominate the weak? Will it ever change?" "Those were the events that saddened our tender souls, and we had to deal with them on a daily basis. The Polish children, who up until a short time ago had been our best friends, now became our bitter enemies. They chased us, threw stones at us and called us names." “The Germans set up fences and encompassed the fences with a wall that was guarded by German and Polish sentinels. In this way, we found ourselves incarcerated in the ghetto." 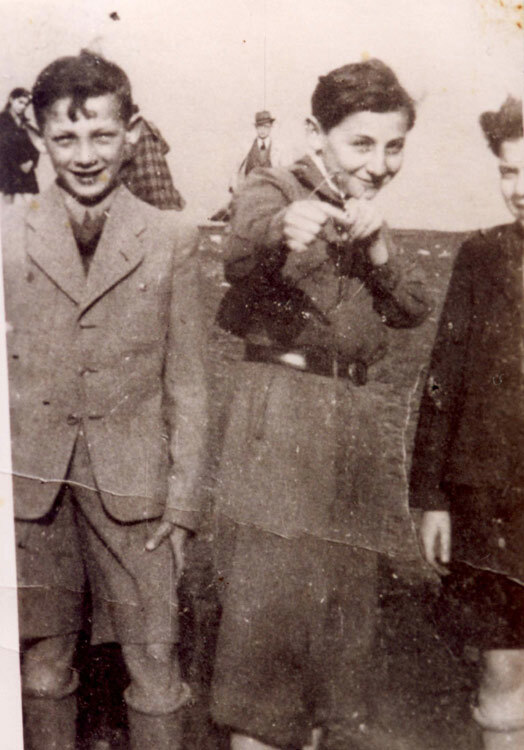 "We children looked at the wall and asked ourselves how it was possible that just over the wall, the Polish children of our age were running, happy and free, studying at school, going to the cinema, walking in the municipal parks." “July 1944. We were ordered to pack the few things in our possession… ‘Celinqa, you’re trembling. Don’t be afraid,’ said my brother, holding my hand. ‘Perhaps you’re right, Tadek, this time they’re not taking us to the well-known death field. They’re not shooting, we’re not walking on corpses, and even so, I’m afraid.’"
"'They’ve promised us that we’ll go by train to Germany, to work. So why am I trembling? Why do I see the baker’s oven in the ghetto all the time?' I try to control myself: 'You have nothing to be afraid of…. The car is full and crowded but thank God we’re together…'"
"Father bent down to us: ‘Listen to me, dear children, who knows where they’re taking us, even though the direction is toward Germany. Who knows if they’ll leave us together. Whoever of us remains alive after the war will go to our address, 12 Liberty Square – that’s where we once lived. That’ll be the meeting place. We’ll wait for each other.’"
"‘Liberty Square, Liberty Square,’ I repeated to myself over and over. What a wonderful name! I had never noticed the street names and their meanings. If we remain alive, if the war ends, if, if, if! I must memorize and not forget: 12 Liberty Square, Kielce." "…Father descended from the lookout place. A ray of light from the lamp in the railroad station had come through the window and illuminated his sorrowful face. His eyes reflected the terrible disaster that he anticipated. ‘Children.’ His words were addressed to all. ‘They’ve changed the direction of the tracks. We’re going to Auschwitz.’"
"‘Auschwitz!’ A shout erupted from everyone. From the other cars, there was a kind of answering echo. ‘Auschwitz. Auschwitz.’ The train continued on its way. ‘Father, why is the word Auschwitz so frightening?’ In one hand, I held my mother’s hand, and in the other, my brother Tadek’s. A thin but solid masculine hand, his strong hand helped me overcome my fears. He held me, and with his other hand stroked my head. ‘Celinqa,’ whispered my mother, ‘soon it will be dawn, and you still haven’t slept, try and fall asleep so that you have strength for tomorrow.’"
Eva was born and raised in Hungary. 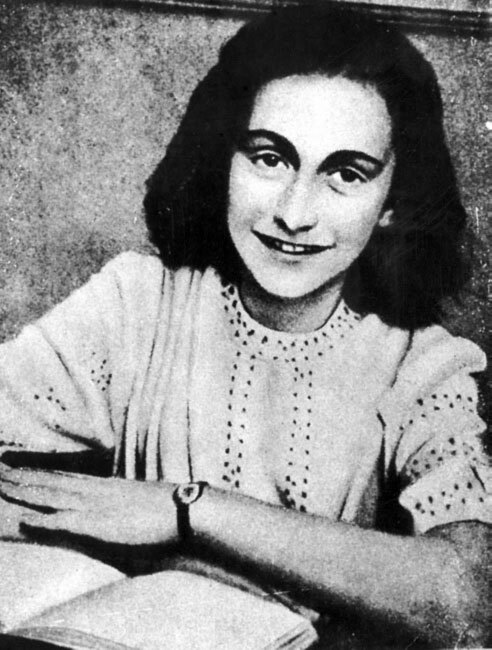 Her parents managed to flee to Switzerland, but Eva was caught and sent to Auschwitz with her grandparents. She was murdered there at age 13. April 5, 1944 "…later, in the afternoon, on my way to Grandma Lujza, I met some yellow-starred people. They were so gloomy, walking with their heads lowered. …Still, I noticed Pista Vadas. He didn’t see me, so I said hello to him. I know it isn’t proper for a girl to be the first to greet a boy, but it really doesn’t matter whether a yellow-starred girl is proper or not. Pa, 'Eva,' he said, 'don’t be angry but I didn’t even see you. The star patch is bigger than you,' he said without laughing, just looking so gloomy… [Grandma Lujza] says she doesn’t even care if she dies. But she is seventy-two, and I’m only thirteen. And now that Pista Vadas spoke so nicely to me I certainly don’t want to die!" April 7, 1944 "Today they came for my bicycle. I almost caused a big drama. You know, dear diary, I was awfully afraid just by the fact that the policemen came into the house. I know that policemen bring only trouble with them, wherever they go. …So, dear diary, I threw myself on the ground, held on the back wheel of my bicycle, and shouted all sorts of things at the policemen: 'Shame on you for taking away a bicycle from a girl! That’s robbery!'" May 10, 1944 "Dear diary, we’re here five days, but, word of honour, it seems like five years. …First, the fence was finished, and nobody can go out or come in. …Actually, everything is forbidden, but the most awful thing of all is that the punishment for everything is death. …It doesn’t actually say that this punishment also applies to children, but I think it does apply to us, too…." Naphtali was born in Poland and raised in Cracow. He and his family were incarcerated in the ghetto, and later he was sent to various camps, among them Bergen-Belsen. He managed to survive the war and immigrated to Israel with his brother after the war. Years later, his brother was appointed Chief Rabbi of the State of Israel. “That same evening we were about to enjoy our last meal at home. Not a single item from our set of cutlery was missing, and all the usual food was served in the normal way at our table. The menu was very sparse, as was the custom in those days: potatoes, slices of bread. It was after eight o’clock in the evening when we were deafened by a volley of shots from various weapons… They roamed the ghetto streets and shot indiscriminately in order to inspire terror in the inhabitants, while their comrades in the unit tightened their stranglehold on the ghetto." "I don’t remember if anyone at the table tasted anything on the plate in front of him that evening …Rabbi Raphael, who was about seventy …sobbed loudly. During the last two years, he had been a member of our household, and it was from him that I learned as much Torah and wisdom as I was capable of absorbing …I always saw him with a smile on his face and he never betrayed his gloomy mood… At this last dinner, he too snapped, and his bitter weeping caused a chain reaction among other people at the table." Israel Ernest tells about his childhood in the Lodz ghetto, which he entered just before he turned 13. He was imprisoned there for four years until he was 17. "What do we see in the street? A very cloudy and cold day. I go out into the street. The street looks gloomy. The stores are very small and poor. There are no big stores to be seen at all. In the windows lies a loaf of black bread. Some wood and small fish…"
Shalom (Kaplan) Eilati was born in Kovno, Lithuania in 1933. In 1941, he and his family were incarcerated in the ghetto. In 1944, at his mother’s initiative, he escaped alone and survived. Of his entire family, only he and his father survived. He immigrated to Eretz Israel in 1946. He is married and has three children. Erika was born in Salonika in Greece. She was sent to Auschwitz with her family. She and her mother survived the camps in which they were incarcerated, and after the Holocaust, managed to find Erika’s brother and father, who had also survived. They returned to their home in Saloniki. Erika established a family, and today she has seven grandchildren. "It was pitch dark and huge spotlights pierced the darkness, blinding us. ‘Steigt schnell aus!’ [Climb out at once! ], they were blinding us. ‘Schnell! Schnell!’ [Faster! Faster!] – but nobody understood. Stunned by the long journey, stiff, hungry, frightened, desperate, everyone tried to jump out of the railroad cars…"
"…The 26 March 1944 was a day like any other, but for me personally a very special day. It is the day on which I sensed what love, brotherhood, assistance and creativity there was in the camp despite all the torturers. …It was my birthday …When we returned from work that evening, I found a small flower on my bed, around which several items had been arranged. I stood there, my mouth open wide with surprise, and a lump in my throat from emotion that left me speechless." The following letter was written by the children of Janusz Korczak’s orphanage in the Warsaw Ghetto to the priest, Marceli Godlewski, head of the church of the converted, who were also incarcerated in the ghetto. Bilha was born in Germany in 1932, and after “Kristallnacht” in 1938, she escaped with her family to Holland, where they were interned in the camp at Westerbork. From Westerbork, they were sent to Bergen Belsen, and from there they were sent via Turkey to Israel in a very exceptional one-time prisoner exchange agreement, in the framework of which Jews were exchanged for Germans who had been living in the Land of Israel (the Templars). "What do I remember about the occupation as a child? One of the first things is that we had to wear the badge. I was eight and a half then. From the day I was born, a gold chain with a Star of David in a circle hung around my neck. My father put it around my neck when he first saw me. I never went anywhere without it." "…I remember that we were two girl friends. The first day we went out with that badge, we also took out our chains (My friend also had a chain with the Star of David), and we walked proudly as Jewesses! I wasn’t ashamed of the badge (the yellow star), on the contrary, I was proud." "…But there was always harassment, the danger that you could be arrested on the street… When I got to school, there was always the guessing game about who was there and who wasn’t. There was something else in the general atmosphere, but from a child’s vantage point, my entire problem was whether or not I would meet the Germans today. If I meet Germans, it’s a bad day. If I don’t, it’ll be good. That was the basic philosophy of a 10-year-old girl… But aside from that, we were children and we tried to be happy…." "Life continued at home without Father, my brother started doing all kinds of jobs in order to earn a living." "Grandma drove us all crazy; she was very nervous. It was really hard for Mother to cope with her, but that’s life. As time went on, the decrees became more frequent, and there were incidents all the time." "Then came the evening when we were all at home. We heard noise and tumult from the street. We knew that it was coming from German trucks. We heard the commotion, the screaming and the crying. Then, by the time the Germans opened the door, my big brother had disappeared. The German read the list and called my brother’s name. Then my mother said: (for me as a child, it came as a shock), 'He is not my son. Since his father hasn’t been at home, I don’t know him. He isn’t here, he’s independent. I don’t know where he is.' But the sentence, 'He is not my son,' was a shock to me. I was so frightened. I have a brother just a bit older than I am and he said to me, '…Sshh… she’s just saying that for them. Be quiet!' and my mother was totally indifferent…"
For my grandchildren and all the children of the world of any religion, I have written my testimony 50 years later so that they will be able to reply to anyone who dares to deny there was a Holocaust and so that they will always be on guard to make sure that there will never again be another Holocaust: NEVER AGAIN." In your opinion, what measures can be taken to ensure that there will never again be another Holocaust: NEVER AGAIN”?